I went into a large corporate Verizon store on Friday to see the Lumia 928. A sales person came over to me to see if I had any questions. I said I have a couple of questions about the Lumia 928 and his face went blank. He was clueless about WP8. So I thought I would ask a simple question, "When will the black be available?" His response was "It only comes in white". Meanwhile, the other sales people were fully explaining the Android OS to other customers. On Saturday, I went into another corporate store located inside a BJ's Wholesale club. I just wanted to see if they knew when the black would be available. I was asked several times by the rep "Why would you want a Windows Phone?" And repeatedly told that there were almost no apps available. She tried over and over to interest me in an Android phone. I told her that I have had a Droid X for the past 3 years and I am sick of it. She gave one more try to get me to get an Android phone and then told me to call back on Monday. This phone is doomed unless Verizon/Microsoft/Nokia address this problem. LeLee092 and lbaxter like this. Not really sure what can be done at this point. Seems most reps have an inherent bias towards whatever they use personally. sravanv, xandros9, Murani Lewis and 1 others like this. Here's what could be a solution. It involves getting the 928. Go to the store, seek that sales rep, and buy the 928. No matter what. If you have family and friends that are interested in WP, go with them to that same store and try to seek that sales rep. Again. Then buy a WP. Again. This tactic is more effective if you space your purchases every week or so. I know, you're hurting the rep's feelings, but hey, no pain no gain. Jazmac, jmajid, metalchick719 and 5 others like this. Carriers will promote what is selling in general at this time its Apple and Android. But from the looks of things Microsoft is gaining ground with WP8 devices and with the launch of the 928 on Verizon I can see sales going through the roof! I went to my Verizon store and bought a 928. Everyone working there knew about it, were enthused by it and most were playing with it while I was there. There was a lot of interest to say the least. On the other hand, the Blackberry Z10 was abandoned in the corner, along with the LG phones - especially the Intuition, which no one knew the first thing about. I have a Note 2, and the Intuition makes that look small and pocketable. jleebiker, Bartdog, biboyflip and 5 others like this. Went to a store in Australia to buy a 920 today. Pointed to the phone and the salesman asked why you'd want it and tried to steer me away. jleebiker, Bartdog, ttsoldier and 9 others like this. This may have been said before, but I think they need o distance themselves from the old iterations of the Windows Mobile O/S. We've all seen it. Whether the argument has any weight or not, consumers remember certain things like Windows Mobile. I find I KEEP having to educate people that this phone is NOT a Windows Mobile O/S. Something like "Have you seen what it's like now?" or something that distinguishes that it IS fresh and new. Do that and I think you will get more people to consider it. I went to the local Verizon Store by me, and I don't think it's farther from the truth. While I had problems getting an upgrade (apparently the reseller I bought my iPhone 5 from upgraded both my lines, instead of one) the person I spoke to loved the 928 and was in the process of dumping the Z10 for it (Which was given to him by corporate), which they have only sold 1 of since launch and it was actually returned. He said the 928 had already sold a few on launch day, so he was definitely recommending it for those sick of Android and iOS, although he was surprised to hear I was switching from the iPhone 5 to it, haha. metalchick719, Neo Nuke and Cellus13 like this. depends on the store/rep. it used to be much worse at my local store (when i bought my trophy). what a hassle that was. with my brother and sister's 928 they were pretty good, although could be better lol. it's getting there. the more popular it becomes the better the sales experience will get. slowly but surely. Windows in general has a certain reputation, as do the old Windows mobile devices. The average smartphone buyer is not very knowledgeable about technology and operating systems, so the old anti-Windows biases are going to be difficult to overcome, even though these devices are entirely new. Combine that with Samsung and Apple pretty much owning the market, and phone company reps having their own pro-Android or pro-Apple biases, and it becomes even harder. Not to mention, Verizon not having a flagship Windows Phone 8 device until so late, and seemingly not caring to market this at all. Microsoft and Nokia are late to the game - there are missing pieces of basic functionality like group messaging, playback of .wav files with older codecs that won't be supported until a later update, and volume control for different sources (eg. music and ringer/notifications) that are not independent of each other. And finally, there are application like Instagram than many average users like, that aren't available for Windows Phone. If we're honest, it's an awful lot to overcome. The 928 seems like a great device, and I still plan on getting one. However, my own excitement has been reduced a bit by the missing functionality, and by reports of QC issues like the windows key not looking right when lit up, and some reported issues with the camera in daylight. This was going to be a Day 1 purchase for me, but I'm now waiting for the first batches to be sold through, in hopes of later batches having better QC. I love smartphones, and have owned many. I will own the 928 at some point too. But the average consumer doesn't look at smartphone technology with the enthusiasm and excitement that a lot of us do. That is going to hurt Windows Phone. In most industries, you usually have the two giant competitors, and then a handful of smaller ones (think Coke vs Pepsi, or McDonalds vs Burger King). I think that Microsoft is destined to be one of the smaller ones. The 928 is a brilliant, but flawed device. Too late for that. Besides, most people don't know anything about the old Windows phones except for what the media reported. I've personally never seen one. Although I've heard it wasn't near as bad as the public was lead to believe. Same thing is happening with WP. There is still a large group of people out there that will put down MSFT products no matter what it is. Not sure why except for the fact that everyone loves to have an enemy. That fact trumps logical thinking every day of the week. Funny thing is we see that in every facet of society. 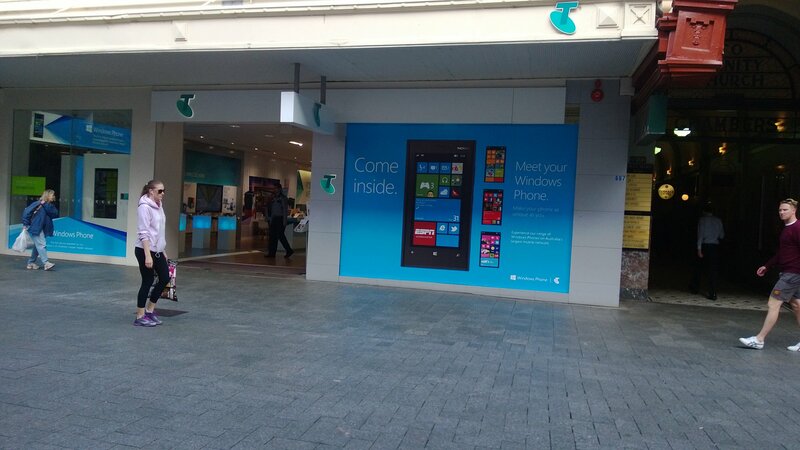 This is the same situation in Canada...everyone questions why you'd want a Windows Phone at the sales shop. There is no way WP8 can do well without some support at a retail level. It seems to be true that since WP lower budget phones offer great value for such a low price their ground will need to be captured here first before gaining high profile market. MikeLip, Funky Cricket, xandros9 and 3 others like this. Sad, but so very true. People love to root for David, and against Goliath, even when it's illogical to do so. Deep inside Verizon, I'm sure they wish they could sell devices from just two companies, Samsung and Apple. They don't seem to care about any other smartphone manufacturer, and of all the major carriers, they have the worst lineup of devices. They seem to care more about their service and how to make more money from it, than they do about device variety (which I get- companies need to be profitable to expand and grow services; VZ probably does not make much money on the devices themselves). More devices equals more support headaches, which I understand. But... the point is... have you seen any commercial ads for the Lumia 928 since it launched? I have yet to see either an online ad (static of video) that i have been presented with - not gone looking for. Nor have i seen a TV commercial. wut. When I bought my 928, my experience was very similar (almost complete ignorance - had to look up the availability, price, etc), except that no one tried to overtly talk me out of it (this may be because the first words out of my mouth were, "I'd like to pre-order the Nokia 928" - if you're sold on something, no one is going to talk you out of it, but if you need to be talked in to it at all, and they don't know squat, they're going to try to sell what they know). On a positive note, when I picked up the phone the next day, they seemed pretty surprised that transferring my contacts was as simple as entering my MS account info and they also seemed pleased with the appearance/fit & finish. A gradual name change would be good. I think the name Surface be great. "I have a new Surface Phone"
"Have u seen the new Surface Phones"
Its alot better than Windows Phone 8 and all the baggage that ppl remember about the old windows phones. jleebiker and Mocah like this. I made a couple trips to verizon stores this weekend. One store had the 928 in the window and was nice to see. The rep did not speak ill of the device, but it was obvious it was new to him and he did not know much about it. I am debating on switching from Sprint for the Lumia 928. The monthly pricing is the main thing holding me back since I currently have a larger discount with Sprint (the rep signed me up was very kind). Anyway it was a nice change of pace because when I walk into Sprint the reps have zero clue what that there is anything other than android or ios. I hoped Verizon would push the device like they did android in the early days. Maybe they will? I am surprised to hear so little about it when this is sweet device that finally made the way to verizon! Its pretty sad that we are still hearing about this crap literally years after the OS has launched. Just as sad that there are still people out there who actually listen to the morons who work in these stores. It doesn't take a lot to find out about a product before you spend your money on it but people just don't want to think for themselves anymore and so this is likely to be the norm for a while. a5cent and wpn00b like this. Happy to say I had a different experience in 2 AT&T stores I visited. Both times, the sales rep was very enthusiastic about WP. Last time I was in, I was looking at the Lumia 920 and the rep pulled out her HTC 8X and compared the 2 phones. The 920 and HTC 8x display was in he front of the store, where the reps usually hang out. I was going to compare with iPhone 5, but couldn't find out where they had hidden them in the store! This app is unavailable because your phone doesn't support WVGA....uh WHAT? Can this phone stand on it's side?